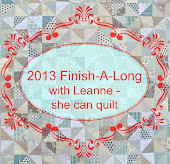 she can quilt: It's time to link up your Q3 Finish-A-Long Finishes. Can’t believe a quarter has gone by again Leanne! Love both your finished quilts! And thanks for organizing all that’s involved. I’m sure it’s a lot of work! Such beautiful finishes though Leanne. I didn't finish anything but perhaps next quarter? Both of your finishes are so gorgeous! Great job. I have linked mine up and my original list is on my blog - Q3 UFO Progress Tab! I so look forward to the day when my lists get shorter!! I finished up 4 out of 5. I'm happy with that accomplishment. Thinking about Q4 now. Fantastic finishes Leanne! By friday I'm hoping to have finished 3 of my 4 goals. This link up is fabulous for motivating some finishes! Lovely finishes. I managed 6 out of 9 with big progress on one more so am feeling pretty accomplished. Now I just need to take pictures of the final quilt and blog about it. Thanks for including me in the tutorials. Wow! Lots of great finishes this quarter. I love your Octagonal Orb quilt. How has this year gone so fast?! Both your finishes are really lovely quilts - and I seem to remember quite a few other projects that were started and finished during the last quarter as well... I'm pretty pleased with my 6/8 - it's better than I thought I'd do! Your finishes are super. My apologies for not joining in too much this quarter. Woohoo! I have some finished this time around. Thanks for all the work you put into this. Thanks so much for all you do with FAL - I've thoroughly enjoyed my first year trying this. It has helped keep me on track and I love seeing what others have been making too. Here's to lots of finishes this final quarter (can't believe how fast the year is passing). Thanks, Leanne, for hosting this helpful finish along! It really is motivating to me. Your two finishes are both so wonderful, Leanne! Thank you so much for hosting this, I need that motivation! Wow, you finished two gorgeous quilts and also kept us all going with the FAL! Kudos to you! The Octagonal Orb is amazing, what lucky recipients! Glad you have the Granny Square to cuddle under.